You never know when an outdoor adventure might turn into an opportunity to enjoy a cold drink. Brewsees sunglasses have bottle openers built into the temple tips, so anytime you’re wearing your shades, you’re ready for an impromptu party. The inventor, Rob Ianelli, used to wear flip-flops with a bottle opener embedded in the sole, but after stepping in something nasty, he started thinking about a better carrying spot. 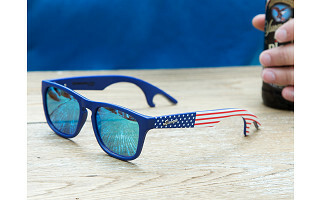 His Brewsees glasses are a wraparound style with polarized lenses, a polycarbonate frame, and anodized aluminum tips. When you’re golfing, fishing, skiing, or biking, Brewsees do double duty. They provide sun protection and keep you prepared for unexpected cocktail opportunities. Cheers! Well hello there Grommet! 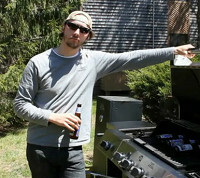 My name is Rob Ianelli and I'm the "loco hombre" that invented the world's first beer-bottle-opening sunglasses: the Brewsees. Having been mildly obsessed with design and practicality from a young age, it's fitting that I eventually paired that love with the second best thing in the world: Beer (of course). I designed Brewsees to have a comfortable fit, high performance polarized lenses and of course, the fiercest of openers made out of 6061 Anodized Aluminum. People thought I was crazy, but guess who's prying now? Me! So as we say around here at the office, "Welcome to the BrewLife," so go ahead and find yourself a cold one. Cheers & Beers! @Guest Hey guest...Grommet co-founder here. You are right!!! Thanks for your input. These awesome sunglasses are for women too! 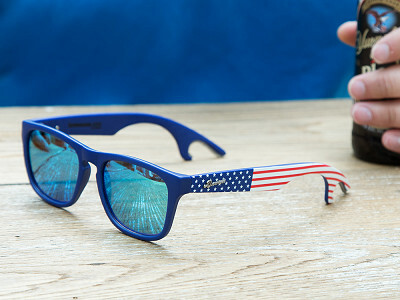 They are perfect for anyone who would enjoy combining their love for beer while staying protected from the sun. When you purchase, please tell us what you think! @Gemma Rob, "High Fashion Model"...those words scare me. Sounds bling-y. I will probably stick with the boy version. :) But the girly girls will go for it. @Jules did we forget to say, "Brew Couture"? oh my! I need the glasses so bad because I couldn't see...is there an opener on each earpievce or just one side? @Joe You betcha there is an opener on each side. We took left-handed and right-handed Pryers into consideration while designing, and the Grommet video above even highlights the classic "Double Pry". Check out the video. You never know when an outdoor adventure might turn into an opportunity to enjoy a cold drink. Brewsees sunglasses have bottle openers built into the temple tips, so anytime you’re wearing your shades, you’re ready for an impromptu party. The inventor, Rob Ianelli, used to wear flip-flops with a bottle opener embedded in the sole, but after stepping in something nasty, he started thinking about a better carrying spot. His Brewsees glasses are a wraparound style with polarized lenses, a polycarbonate frame, and anodized aluminum tips.